Winter citrus holds a kind of magic that is the antidote to dismal days. It doesn't take much, sometimes just a wheel of Meyer lemon floating in my Earl Grey is a fine pick-me-up. Blood oranges are my favorite of all the winter citrus. They tend to be extra-aromatic and their gorgeous ruddy peels hint at a deep crimson interior. Their flavor is more pungent than regular oranges and they tend to be less acidic. I'm prone to peel and eat one while standing over the sink (so juicy!) but lately I've been adding them to my morning smoothie. The flavor seems to give me an extra ounce of zip and I'm sure the vitamin C doesn't hurt, either. I've never used blood oranges in my baking so I figure now is the perfect time to remedy that oversight. Maybe it's the temperament of my heart and its need for color and beauty in winter months, but right now roses seem more beautiful than ever. The only thing I know for sure is that I was an embarrassment at the market asking nearby strangers 'have you seen these roses?'. I couldn't get over their electric violet edges. They practically glow. I couldn't resist using their petals as cake decorations. I even dotted a few with honey and added small bits of gold leaf to match the cake. 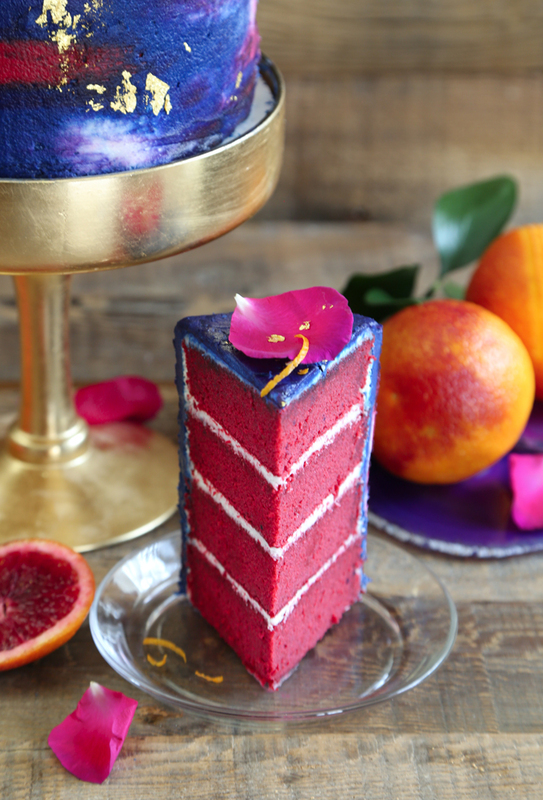 I understand the word 'watercolor' usually calls to mind airy pastels but this cake is bold! I've always loved bold watercolor paintings so I wasn't too shy about trying the effect with frosting. 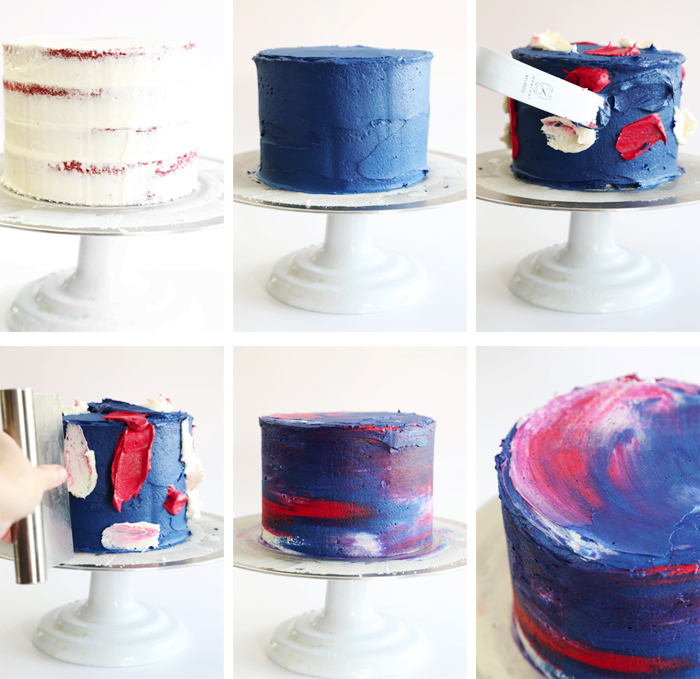 Have you tried the watercolor cake decorating technique in buttercream? It's easier to achieve than you might expect. Let me show you how it works! First, fill this cake with white orange-flavored buttercream and then frost the outside in a thin, even layer (crumb coat). Place the cake on a turntable, or if you don't have one a lazy-susan will work also. After a quick chill in the refrigerator, cover the cake in a second (and thick!) coat of navy blue buttercream. Next, randomly apply dollops of fuchsia, white and navy buttercream to the sides and top of the cake. Hold a bench scraper upright against the edge of the cake and turn the cake while you scrape away excess icing. The motion will smear and blur the colors together. Smooth the top of the cake with the bench scraper. Use an offset-spatula to level the top edges of the cake. Chill the cake until the frosting is set. The icing will darken to a deep vivid color as it stands, so expect this. 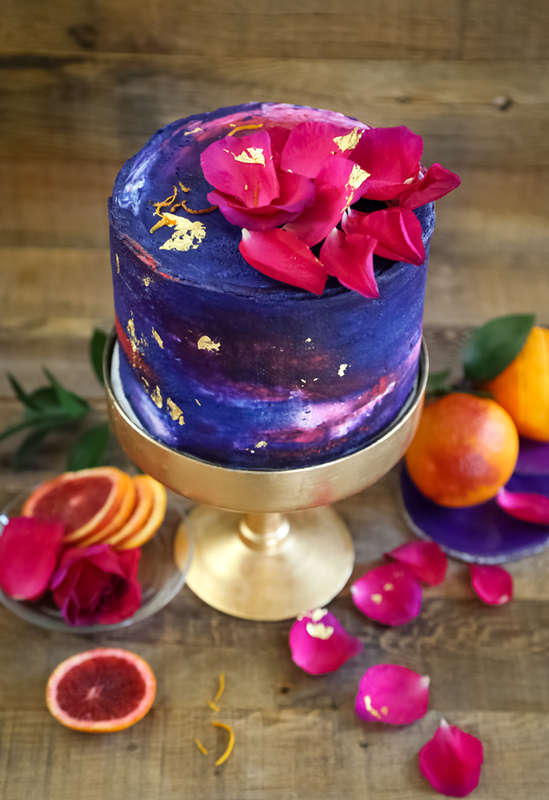 I used a tiny bit of gold leaf on the sides of the cake, which you can apply with your fingers. If the gold leaf doesn't want to stick, use dots of honey before adding the gold leaf. The cake batter will be slightly pinkish after adding the blood orange to the mix, but I wanted a more vivid interior. I used equal parts fuchsia gel food color and red gel food color. I felt the color should match the intensity of the cake's flavor - and it does! 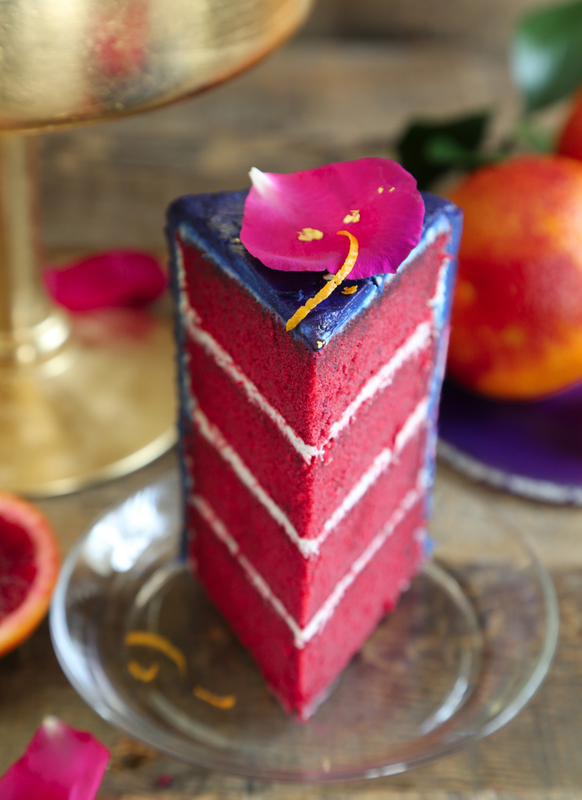 This cake has many layers of citrus flavor with blood orange zest, puree and blood orange soda in the batter. It also has an orange-infused soaking syrup that makes the finished cake moist and delectable. This confection requires several steps, but I think the end result is well worth the effort. It's a nice weekend baking project that has the added benefit of aromatherapy. For the orange puree, peel two blood oranges and remove any visible seeds before pureeing them in a blender. Make the cakes: Preheat oven to 350°F. Grease and flour four 6-inch round baking pans (or three 8-inch pans) or use flour-based baking spray. Whisk together flour, baking powder and salt in a large bowl. In a separate mixing bowl or the bowl of a standing mixer, beat together the unsalted butter and sugar. Add egg whites one at a time and beat well after each addition. Add the orange zest, extract and puree. Mix ingredients until well-combined. Beat the flour mixture and soda alternately in three additions, beginning and ending with flour. The batter may look curdled, this is normal. Add food color; mix. Scrape down bowl edges with a rubber spatula and mix again briefly. Add additional color if needed for a vibrant hue. Divide batter between prepared pans. Bake for 30-35 minutes or until a toothpick tester comes out clean. Let cakes cool for a few minutes before turning them out and placing them on a wire rack. Let cool slightly. Level the tops of the cakes with a serrated knife or cake leveler. Make the syrup: Heat the sugar and water in a saucepan until the sugar is melted, stirring occasionally. Remove the syrup from the heat and let cool slightly. Add the liqueur. Stir well. Brush the tops of the cakes with the syrup using a pastry brush. Keep basting the cakes until all of the syrup is used. Let stand for 1 hour, or until the cakes are completely cooled. Make the frosting: In the bowl of a stand mixer fitted with the whisk attachment, cream butter and powdered sugar together. Once the ingredients are incorporated, add the extract. Add milk or cream one tablespoon at a time until the frosting is thinned and spreadable. Whip until light and fluffy, about 5 minutes. Assembly: Fill the cakes with 1/2 cup frosting each and cover the outside of the cake in a thin layer using an off-set spatula. Refrigerate until firm, about 15 minutes. Meanwhile, divide the frosting and tint it. Place 1/2 cup frosting in a small bowl and add equal portions of fuchsia food color and red food color (about 1/2 teaspoon each); stir well until a consistent color is achieved. Add more color as desired. Cover the bowl of frosting with a damp paper towel so it doesn’t dry out. Remove 1/2 cup of white frosting to a separate bowl; cover with a damp paper towel. Tint the remaining frosting with the navy blue food color. 1 used approximately 1 1/2 tablespoons. Keep in mind the color will darken after the cake is frosted and has time to set. 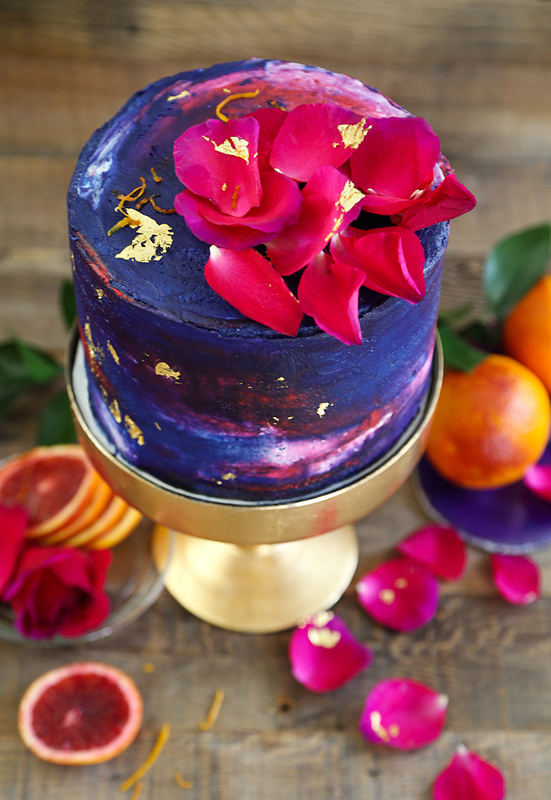 Add gold leaf to the sides of the cake using your fingers if desired. Scatter top of cake with organic rose petals just before serving. This is so beautiful! I love blood oranges, and the watercolor effect is so pretty. Beautiful! And that beauty is so welcome today. Thank you. Yup, I pretty much love you more than ever with every post. 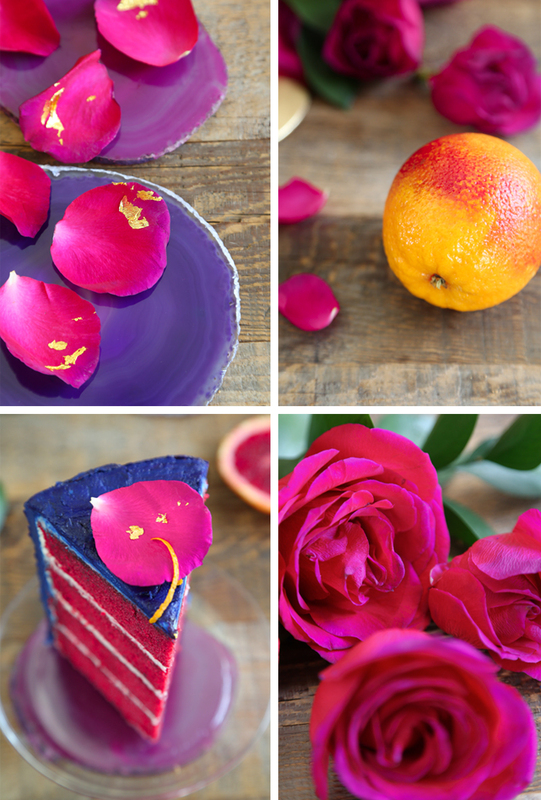 I freakin' love COLOR and I love oranges, so a bold orange cake? Right up my alley. But, honestly, it's your photos I love most of all. I could drool here all day - and it doesn't cost me a calorie. Woot. This is so beautiful!!! I love all the color you bring to your recipes, so fun!!! This is gorgeous and it sounds yummy too. I love blood oranges! Good morning, sweet Heather! I cannot think of a more beautiful, nor more perfectly colorful post! You have outdone yourself, dear friend! A stunning pictorial, as well as tutorial! Thank you for making this dull winter day such an anticipation of Spring! This is beautiful! Do you think this would work with a swiss meringue buttercream, or would it not have the right texture? Thank you!